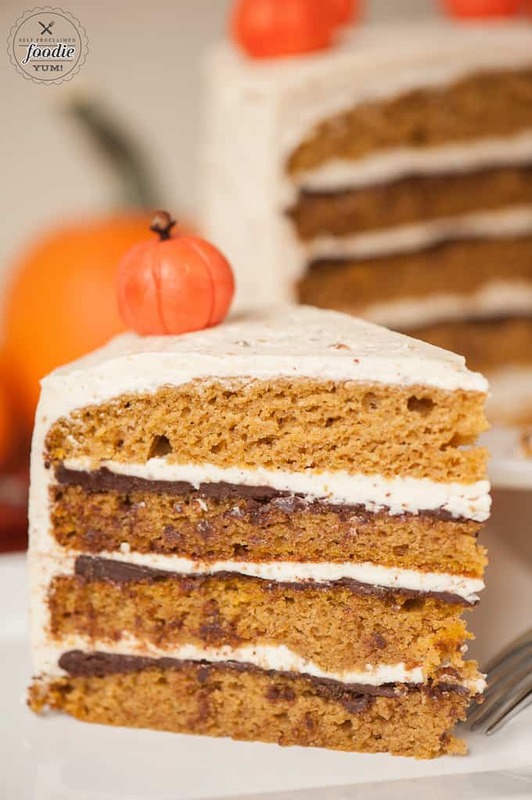 The best delicious fall dessert is this moist homemade Layered Pumpkin Cake with hazelnut buttercream, drunken chocolate ganache, and marzipan pumpkins! So… I may have gone a little overboard with the pictures on this recipe. I don’t make cakes that often, so when I do I guess I go a little snap happy with my camera. This recipe, in its entirety, was provided by my incredibly talented friend, Mindy, of Decadent Creations. 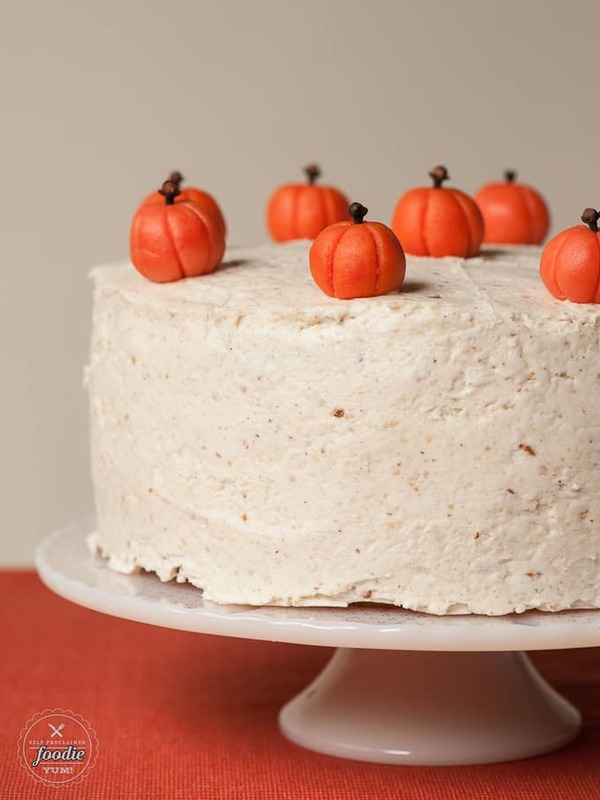 She sells this cake during the fall at the Farmers Markets and its oh-so-amazing. 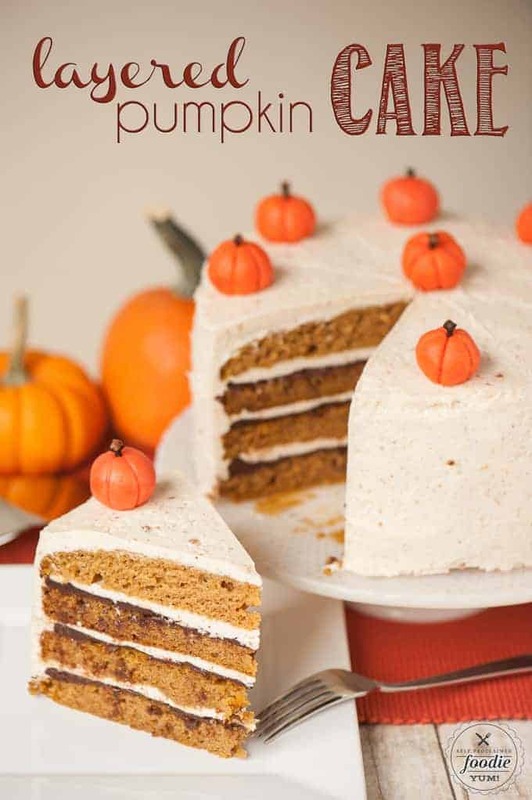 The cake is the most moist and forgiving pumpkin cake. She tells us to use bread flour in the recipe. I asked her why and she said it holds up best to the moisture from the pumpkin. This cake recipe would be perfect for muffins too. When it really comes down to it, there isn’t much difference between a really good muffin and a cupcake, don’tcha think? The final cooked cake was so easy to work with. I used a large serrated edge knife to cut each layer in half creating four thin layers. I love thin multi-layered cakes because they’re not only pretty, but you’re guaranteed to get cake, ganache, and frosting in each bite when its prepared like this. I’m the kind of eater that has to have a bit of everything on my fork with every bite, so this makes me extremely happy. 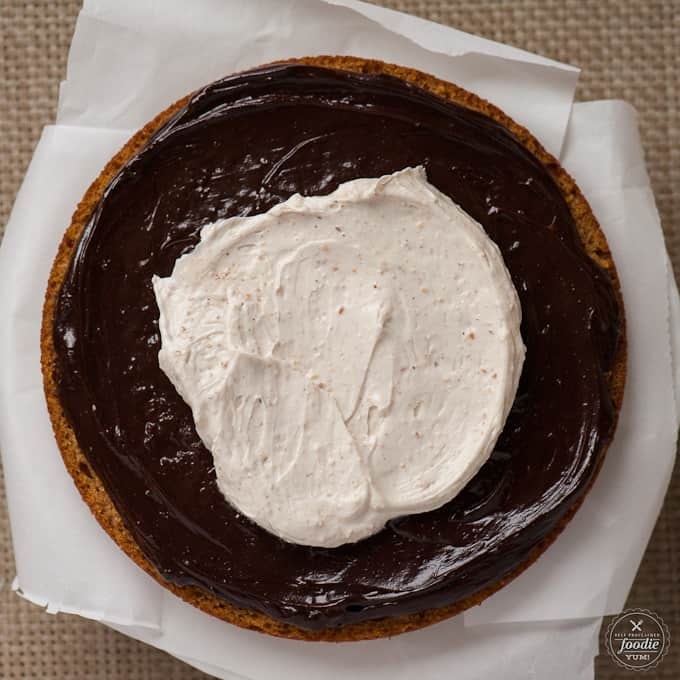 The ganache spreads beautifully when its just the right temperature. 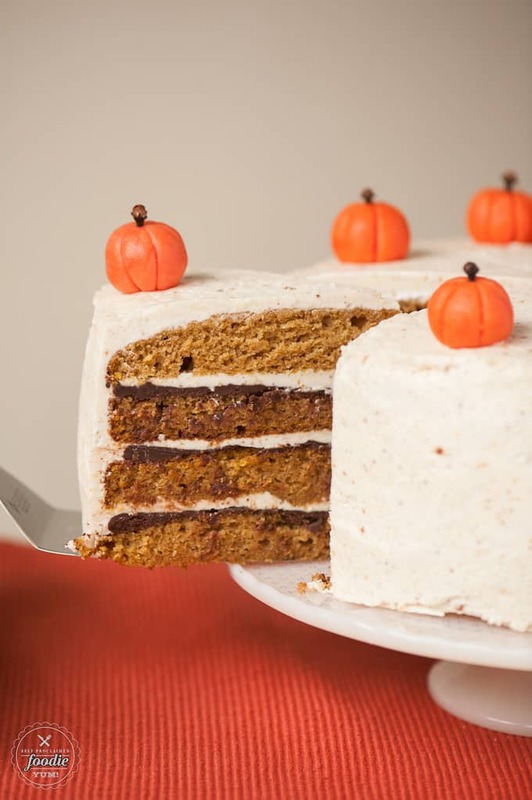 You want it to be smooth enough to spread but not so hot that it sinks into or off of the cake. 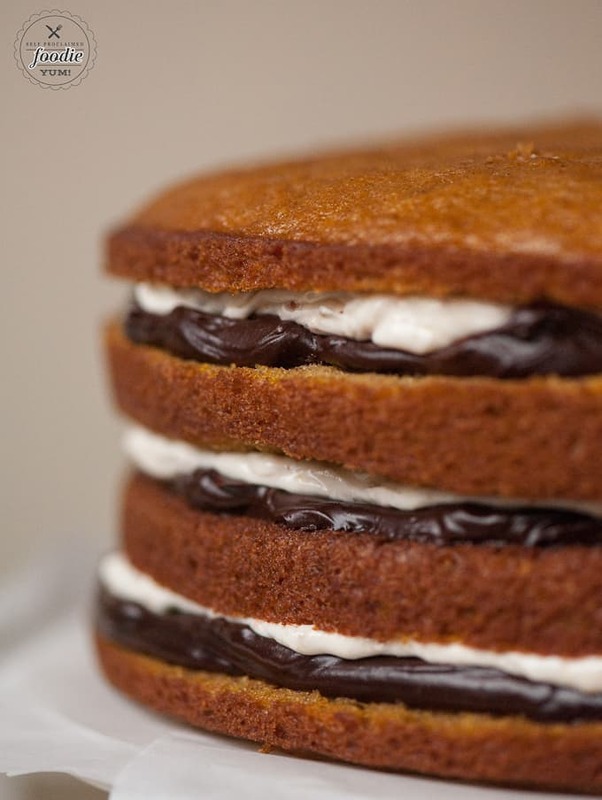 The buttercream is incredibly light and fluffy and smooths out perfectly over each ganache and cake layer. I decided to put a thin layer of frosting on the outside to give it a nice crumb coat. The beauty of buttercream is that there is so much darn butter in it, that when you refrigerate it, everything gets rock hard. Then, when I was ready to spread the final layer of buttercream on the cake, I just allowed the extra frosting to sit out at room temperature until it was spreadable before removing the cake from the oven. 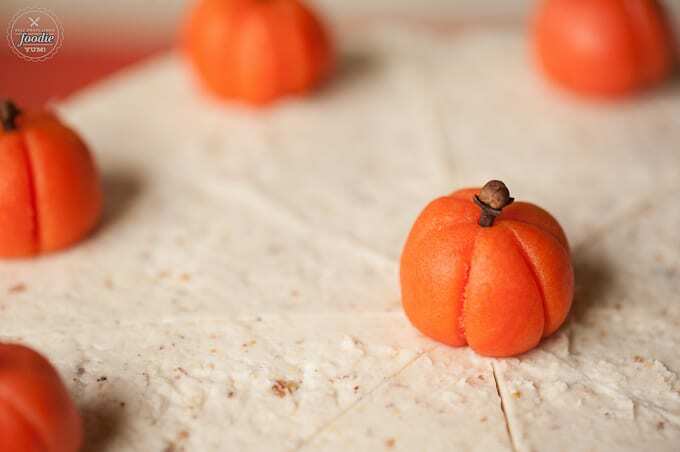 Aren’t those little marzipan pumpkins the cutest! They only took me a few minutes to make and made the final cake so darn purdy! If you ask me, a good cream cheese frosting can’t be beat. 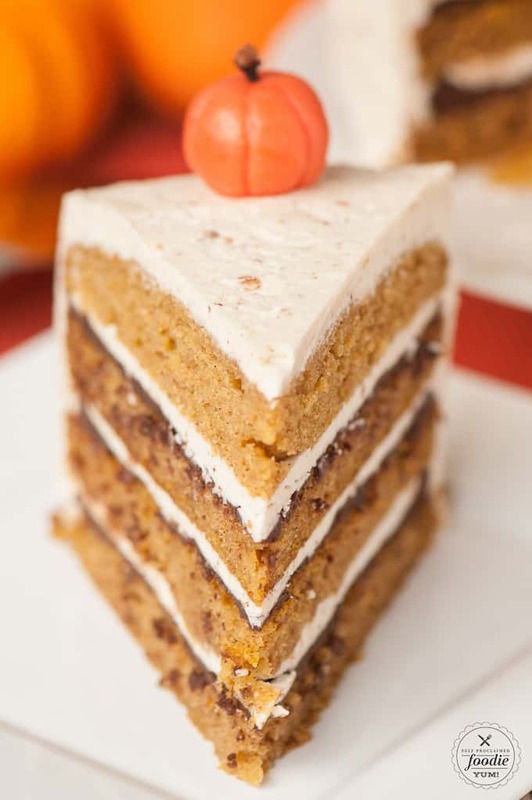 This buttercream, especially with the hazelnut butter added for texture and taste, are an incredible addition to this cake. Another shot of the little pumpkins below simply because I love them. I brought this monster cake into work. One of the ways my co-workers described it was “I thought it was going to be really sweet but all the layers really balanced all the flavors and sweetness out.” I couldn’t agree more, Scott! See, when you add booze to chocolate, it reduces the sweetness just the right amount. 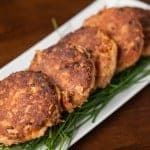 Don’t let all the steps to the recipe fool you. 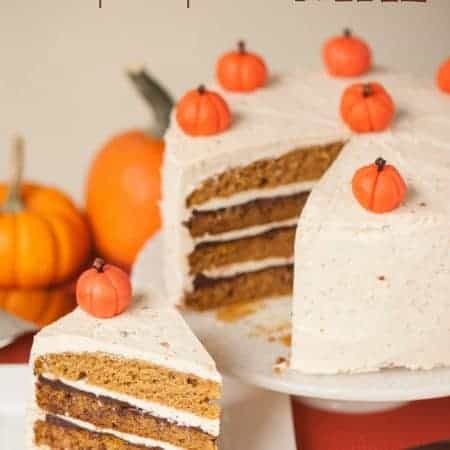 This cake really is super easy to make. 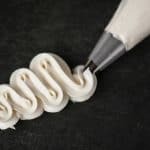 The buttercream may seem intimidating, but as long as you have a thermometer to get the melted sugar to the right temperature, its actually tons of fun to watch it to come together. 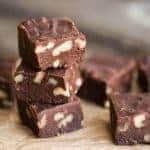 Chocolate ganache only takes a few minutes to make. The smiles you will get from the people who enjoy this cake will make it all worth it. Sheesh, how many pictures did I take? There we go. Last picture! Now, what are you waiting for? Go make the cake!!! Combine all dry ingredients (flour, sugar, baking soda & powder, salt, and spices) in a stand mixer with a paddle attachment on speed 1. Add all remaining ingredients and mix until combines, scraping the bowl to ensure a homogeneous mixture. Divide the batter evenly between two 9 inch pans lined with pan spray and parchment. Bake 28-35 minutes at 350F. 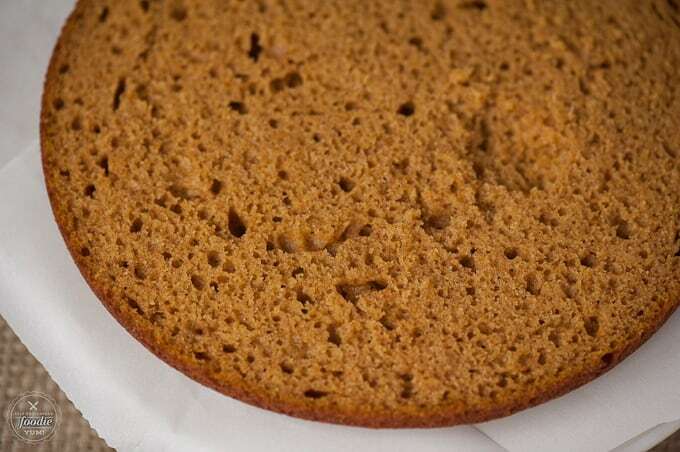 The cakes are done when a toothpick comes out cleanly when poked in the center of the cake. 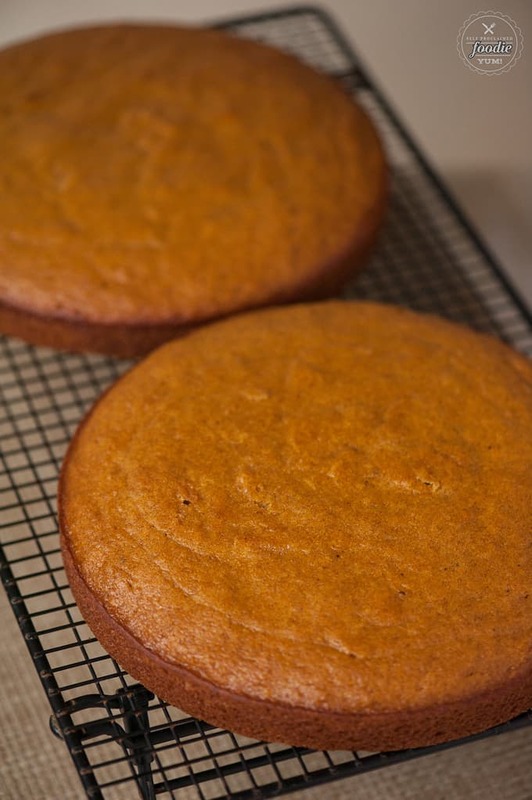 Allow time to fully cool on a cooling rack. 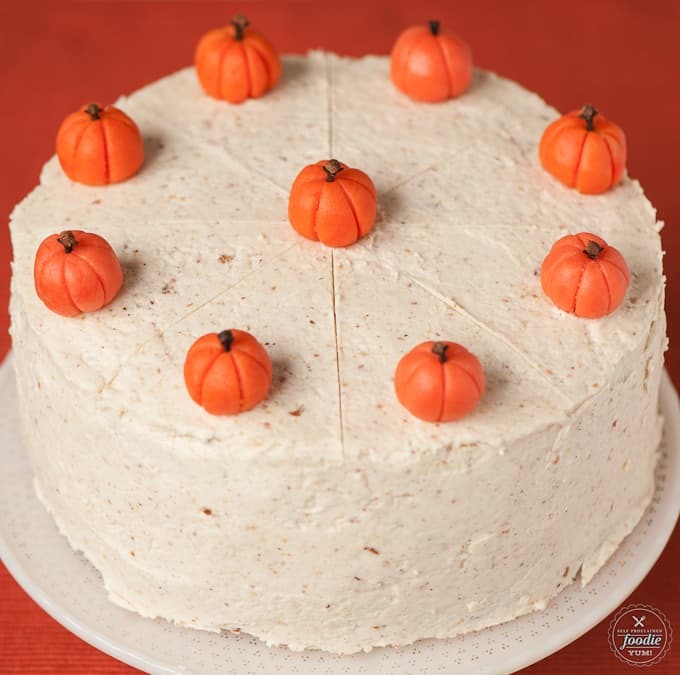 Follow directions for my Perfect Buttercream frosting. Once done, fold in hazelnut butter. Cald the cream in a small saucepan or microwave. Pour over combined chocolate and corn syrup, stir with a whisk until smooth and homogeneous. Stir in rum and cinnamon, allow the mixture to set in a shallow pan or plate at room temperature before using (at least 30 minutes). 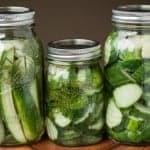 If the mixture sets to a point where it's no longer spreadable, simply microwave it and stir it for very small intervals (5 seconds at time in the microwave). Add the food coloring to the marzipan and mix well with hands like it was play dough until all of the color is even. Divide the dough into 9 equal sized portions. 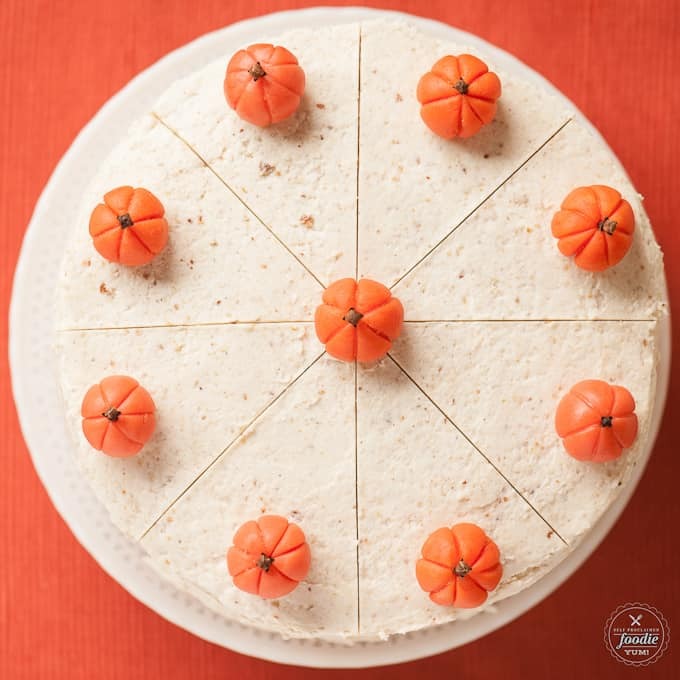 Use hands to roll each portion into a ball and then use butter knife to indent grooves down the side to make it look like a pumpkin. Insert a whole clove into the top for the stem. 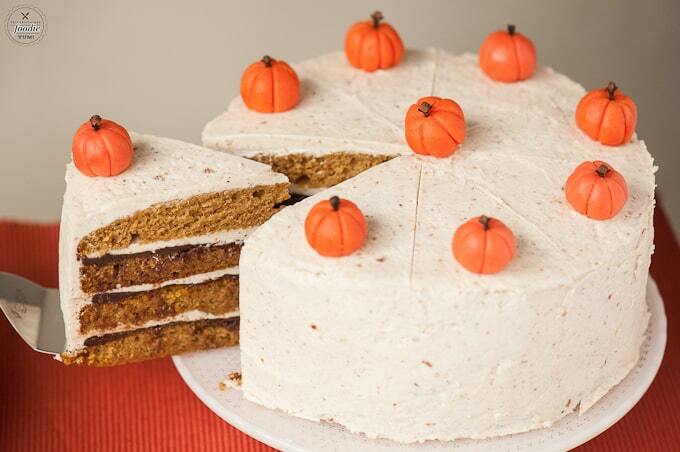 Top cake with marzipan pumpkins.